The Schutzstaffel (help·info) (SS) was a large security and military organization controlled by the National Socialist German Workers Party (Nazi Party) in Germany. "SS" was sometimes written in Runic as , and this symbol was put on the SS flag and insignia. The SS played a major part in The Holocaust. For example, they ran the Nazi concentration camps and death camps, where they killed millions of people. After World War II, judges at the Nuremberg Trials ruled that the SS was an illegal criminal organization. This meant its only goal was to commit crimes against civilians. The judges also said that the SS was the organization that had done most of the Holocaust. The Nazis saw the SS as a special unit, like the Praetorian Guard (which used to guard Roman emperors). To be chosen for the SS, a person had to be racially "pure". This meant they had to prove that all their ancestors were "Aryan". They also had to be completely loyal to the Nazi party. They could never ask questions or disagree with anything the SS did. The SS had two different parts. The Allgemeine-SS ("General SS") were the Nazis' police. The Waffen-SS ("Armed SS") were special units of soldiers in Nazi Germany's military. The Waffen-SS became known for fierce fighting and brutality against civilians and prisoners of war. Its units helped crush the Warsaw Ghetto Uprising, where Polish Jews tried to fight back against the Nazis. Waffen-SS units also killed many American prisoners of war during the Battle of the Bulge in 1944. The SS had its own rank system, insignia (symbols and marks of rank), and uniforms. This made the SS different from the German military, the Nazi party, and people who worked in the German government. As the Nazi party gained more and more power in Germany, it gave control of more important jobs (like law enforcement) to the SS. Many SS organizations became as powerful as parts of the government. The Nazi party decided that to help it keep its power, it needed to give the SS two even more important jobs. One of these was to create and run the Sicherheitsdienst (SD), the Nazi security and intelligence service. The other was to control the Geheime Staatspolizei (Gestapo): the SS secret police. Because it was in charge of so many important things, the SS could do almost anything it wanted. As the SS's leader, Heinrich Himmler used the SS to put the Final Solution into action. 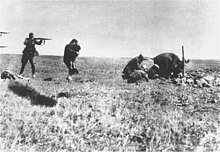 The SS Einsatzgruppen murdered many civilians, mostly Jews, in the countries controlled by Nazi Germany during World War II. The SS was in charge of creating and running concentration camps and death camps (camps where people were sent to be killed). In these camps, millions of prisoners died from many causes, including murder, starvation, disease, freezing to death, and being experimented on by Nazi doctors like Josef Mengele. After the war, the judges at the Nuremberg Trials decided the SS was a criminal organization (a group that was created only to commit crimes). They ruled that the SS had committed war crimes and crimes against humanity. They also said that the SS was the organization that had carried out most of the Holocaust. ↑ 1.0 1.1 Weale, Adrian (2010). The SS: A New History. London: Little, Brown. ISBN 978-1-4087-0304-5. ↑ Höhne, Heinz (2001). The Order of the Death's Head: The Story of Hitler's SS. New York: Penguin. pp. 136–137. ISBN 978-0-14139-012-3. ↑ Stackelberg, Roderick (2002). Hitler's Germany: Origins, Interpretations, Legacies. London; New York: Taylor & Francis. p. 122. ISBN 978-0-203-00541-5. ↑ Himmler, Heinrich (1936). Die Schutzstaffel als antibolschewistische Kampforganisation (in German). Munich: Franz Eher. p. 134. ↑ Flaherty, T. H. (2004) . The Third Reich: The SS. Time-Life. p. 156. ISBN 1-84447-073-3. ↑ Stroop, Jürgen (1943). "The Stroop Report: The Warsaw Ghetto is no more". Jewish Virtual Library. ↑ Murray, Williamson; Millett, Allan R. (2001). A War To Be Won: Fighting the Second World War. Harvard University Press. p. 468. ISBN 978-0-67400-680-5. ↑ Reynolds, Michael (February 2003). "Massacre At Malmédy During the Battle of the Bulge". World War II Magazine. http://www.historynet.com/massacre-at-malmedy-during-the-battle-of-the-bulge.htm. ↑ Laqueur, Walter; Baumel, Judith Tydor (2001). The Holocaust Encyclopedia. New Haven; London: Yale University Press. p. 604. ISBN 978-0-30008-432-0. ↑ Lumsden, Robin (2002). A Collector's Guide To: The Allgemeine–SS. Shepperton, Surrey: Ian Allan. pp. 80–84. ISBN 0-7110-2905-9. ↑ Dear, Ian; Foot, M.R.D., eds. (1995). The Oxford Guide to World War II. Oxford; New York: Oxford University Press. p. 815. ISBN 978-0-19534-096-9. ↑ Rummel, Rudolph (1992). Democide: Nazi Genocide and Mass Murder. New Brunswick, NJ: Transaction. p. 12. ISBN 1-56000-004-X. ↑ Bessel, Richard (2006). Nazism and War. New York: Modern Library. pp. 118–119. ISBN 978-0-81297-557-4. ↑ Hilberg, Raul (1985). The Destruction of the European Jews. New York: Holmes & Meier. p. 222. ISBN 0-8419-0910-5. ↑ Office of the United States Chief of Counsel for Prosecution of Axis Criminality (1946). Nazi Conspiracy & Aggression. Government Printing Office. ↑ Stein, George H. (1984). The Waffen SS: Hitler's Elite Guard at War, 1939–1945. Ithaca, NY: Cornell University Press. pp. 258–263. ISBN 0-8014-9275-0. This page was last changed on 5 October 2018, at 07:26.